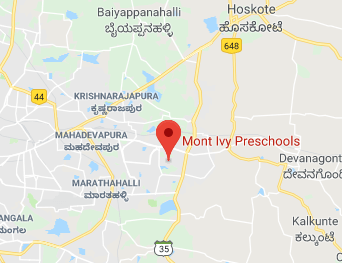 Around 1 km from the ITPL, Mont Ivy Preschools is located in a spacious, green campus in Whitefield, Bangalore. The campus is well-equipped with basic amenities and has a state-of-the-art security system. Mont Ivy has a peaceful surrounding - ideal for early child care and education - and is located in front of the lush green ECC campus.